WORTON — Among the agricultural producers to be featured on the season premiere of MPT’s “Maryland Farm & Harvest” series Tuesday night is Red Acres Farm in Worton. The episode will air at 7 p.m.on MPT-HD. It will be rebroadcast at 11:30 p.m. Thursday, Nov. 16 and at 6 a.m. Sunday, Nov. 19. And additional showing will be on MPT2 at 7:30 p.m. Friday, Nov. 17. “Each week, Maryland Farm & Harvest takes viewers on a journey across the state, telling stories about the farms, people, and technology required to sustain and grow Maryland’s number one industry: agriculture. Over the past year, MPT’s production team has filmed stories at more than four dozen farms in preparation for the new season. Maryland’s rich agricultural heritage, the importance of bees, and growing crops in the face of changing weather patterns are among themes covered in depth during upcoming episodes,” state a news release about the upcoming season from the Maryland Department of Agriculture. Red Acres Farm has been in Bryan Williams’ family since the 1880s. He said his great-grandparents raised turkeys that were shipped all over the country. The farm also was a dairy and vegetable operation. 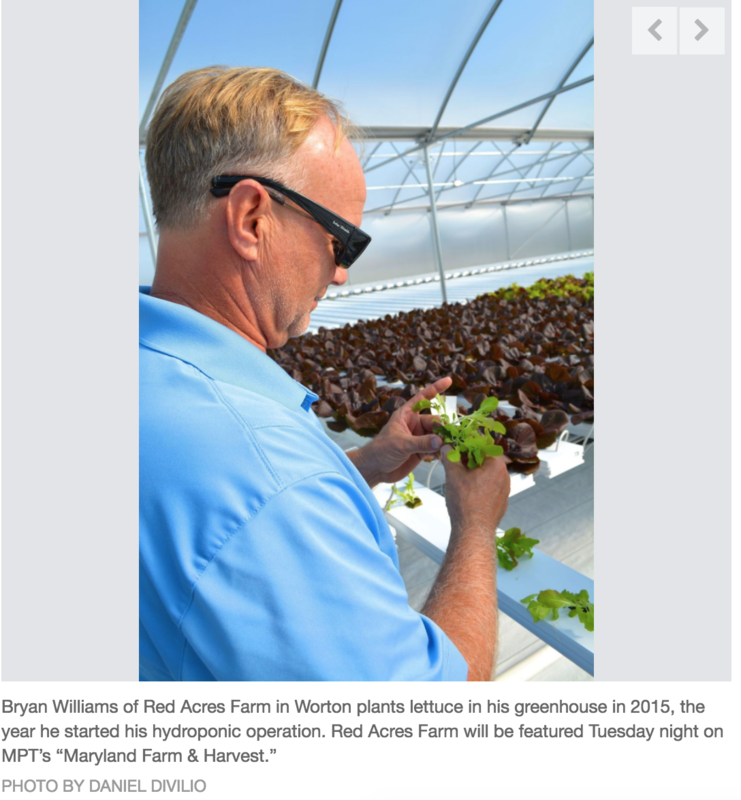 Now, Williams grows grain, hay and straw, as well as hydroponic salad greens. He launched the hydroponic operation two years ago in an effort he said to keep a family farm going through diversifying operations. Red Acres lettuce can be found in a number of Kent County restaurants and stores. Williams also has customers in Talbot and Caroline counties and across the state line in Delaware. He hopes to see the operation continue to grow. “We’re looking to expand a little bit and keep our customers happy,” he said. Williams said MPT first came calling during production of last year’s season, but the schedule filled up before he could could get a slot on the lineup. He said producers contacted him again in February and scheduled a trip out to the farm for June. The producers were hoping to visit Red Acres Farm while Williams was harvesting hay and straw, he said. He said the weather makes that sort of scheduling uncertain, but in mid-June, producers were at the farm with cameras rolling. Also featured in the season premiere is another Mid-Shore operation, Nature’s Garlic Farm in Easton. During the episode’s “The Local Buy” segment, host Al Spoler introduces viewers to gourmet hardneck garlic and shares how farmer Jim Reinhardt grows and harvests his garlic. Reinhardt is a great proponent of eating garlic. He eats raw garlic every day. His favorite method is to smash the bulb and then chop it. Some like to slice the bulb which results in a sweeter taste. “When you smash them, you get a more robust garlic flavor,” he said. Reinhard started growing garlic in 1999 for personal use. He would give some to family and friends. For farming, most of his farming efforts were in corn, soybean and wheat. In 2014 he went commercial with garlic. He had learned much about the growing of garlic from his own efforts and attending some day classes at Cornell University in New York. He has about 12 acres under development on his farm on the edge of Easton. The MDA is MPT’s co-production partner for Maryland Farm & Harvest. “Agriculture is Maryland’s largest commercial industry, contributing more than $17 billion in revenue each year. As of 2016 approximately 350,000 Marylanders are employed in some aspect of agriculture. The state has 12,300 farms accounting for approximately two million acres, with nearly 6,000 full-time farmers,” the MDA release states. More information about the series is available at mpt.org/farm. Join the conversation on social media with the hashtag #MDFarmHavestFans.